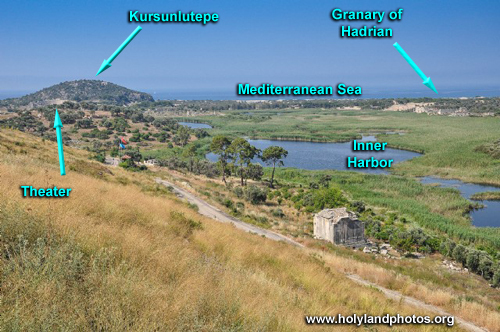 Patara is an ancient Lycian harbor city located on the southwestern coast of ancient Lycia. In ancient times it is possible that the Xanthus River flowed through it, but today this river flows northwest of the ruins. 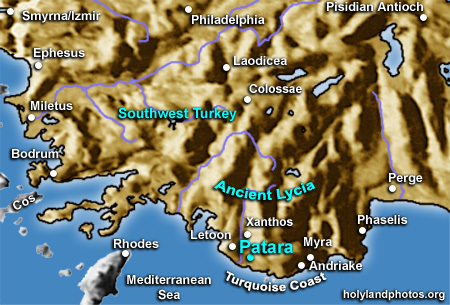 Patara was the major port city for Xanthos that was located 6 mi. [10 km.] north, up the Xanthus River. In ancient times it was believed that the god Apollo spent the winter here—summering on the island of Delos! To view the recently discovered "oldest lighthouse in the world" Click Here.